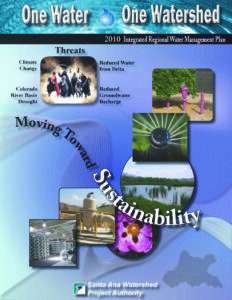 Integrated Regional Water Management (IRWM) is a collaborative effort to manage water and watersheds in a region. IRWM crosses jurisdictional, watershed, and political boundaries; involves multiple agencies, stakeholders, individuals, and groups; and addresses the issues and differing perspectives of everyone involved through mutually beneficial solutions. 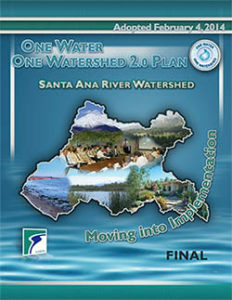 The Santa Ana River watershed Integrated Regional Water Management Plan is known by stakeholders as the “One Water One Watershed” (OWOW) Plan, a name that originates in the plan’s comprehensive view of the watershed and water issues; one in which all types of water (imported, local surface and groundwater, stormwater, and wastewater effluent) are viewed as components of a single water system, inextricably linked to land use and land cover. 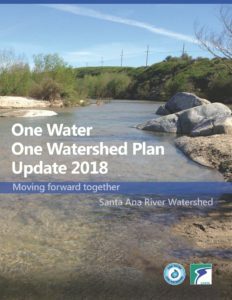 On February 19, 2019, the SAWPA Commission officially adopted the One water One Watershed (OWOW) Plan Update 2018, the Integrated Regional Water Management (IRWM) Plan for the Santa Ana River Watershed. This plan represents the culmination of the work of over 100 authors from water agencies, non-profits and other stakeholders in the watershed who worked together to analyze, develop and describe new integrated implementation actions needed to address the water challenges facing the watershed. The Plan reflects a collaborative planning process that addresses all aspects of water resources in the Santa Ana River Watershed. It includes planning of future water demands and supplies over a 20-year time horizon within the watershed as a hydrologic and interconnected system. 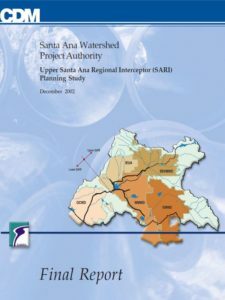 SAWPA launched the update to the OWOW Plan on April 20, 2011, with the signing of a partnership agreement with the U.S. Bureau of Reclamation which brought a Basin Study to bear on the Santa Ana River watershed. OWOW 2.0 Plan focused on the theme “Moving into Implementation” to encourage the scoping and research included in the original OWOW Plan be the starting point for broad implementation of watershed-scale efforts. SAWPA launched the stakeholder-driven effort to create the OWOW Plan April 17, 2007. The core of the approach was for the plan to be crafted, with facilitation by SAWPA, by the engaged people and agencies from across the watershed. The OWOW Plan was the first for the watershed within the California Integrated Regional Water Management program which was created in 2006 with the passage of Proposition 50, and administered by CA Department of Water Resources. The 2005 IWP Update was prepared by SAWPA and adopted by the SAWPA Commission in June 2005. 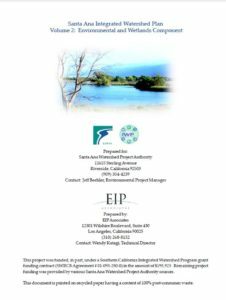 This document provided updates to projects that sustained the Integrated Watershed Program in the Santa Ana River Watershed. 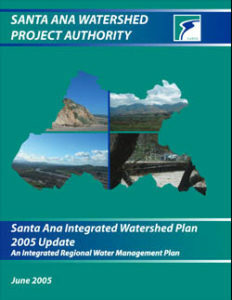 In 2002, SAWPA developed a multi-phased planning process called the Integrated Watershed Plan (IWP). This Plan has three components: the SARI Planning Study, the Integrated Water Resources Plan, and the Environmental & Wetlands Component. This Plan is closely related to the Southern California Integrated Watershed Program (SCIWP). 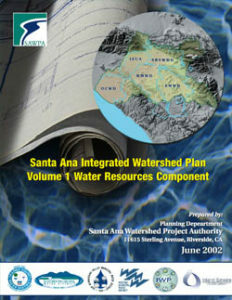 The Water Resources Plan was first written in 1998 to provide a watershed-wide evaluation of water supply needs and plans to optimize the use of all water resources in the Santa Ana River watershed, integrate the watershed planning effort with Metropolitan Water District’s Integrated Resources Plan Update, and provide descriptions of future projects within the Santa Ana River watershed. The Plan was based on the 2000-2001 population, water demand, and water supply information as the project baseline, and then planning horizons were developed for 2025 and 2050. SAWPA owns capacity rights or owns outright approximately 93 miles of pipeline known as Inland Empire Brine Line, previously called the Santa Ana Regional Interceptor (SARI) Line. Construction on this pipeline began in the 1970′s and has had several additions up through the year 2001. This planning study reviewed the use of the line, maintenance, costs, and provides recommendations for future actions.